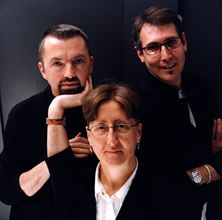 cheek2cheek productions, which was set up in London in 1998 by Andrew Odgers, Janet Potter and Séamus Rea with the aim of making entertaining and amusing films which present positive images of gay men and lesbians. The company's first film, a short called Ginger Beer, was completed in April 1999, has been screened at film festivals throughout the world and has won three awards. Since then, we have made two more films - Two Minutes after Midnight and The Judas Kiss - - and branched out into concerts and theatre events, first as a way of raising funds to make the films and later as interesting events in their own right. In principle, Andrew and Janet produce and Séamus Rea directs but all three of us have worked so closely over the years that the whole process of film-making, from development through shooting and post-production, has become one of close collaboration by all three of us. Janet Potter is a Londoner who has 25 years of experience of film and video, working as producer, director, camera operator and editor. Janet completed a Diploma in Applied Photography, Film and TV at Westminster College in 1978. She went on to attend St. Martins in 1987/88 gaining a MA in Independent Film and Video. Since 1989 Janet has worked for Hammersmith and Fulham Council as a Producer/Director and has produced 12 documentaries and dramas on either film and video for the Council. These have been used for information, training and promotion of the Council’s services. In 1993 she co-produced and directed a short film which was screened at the Raindance Independent Film Festival. Andrew Odgers emigrated to London from South Africa in 1989 and, as a member of the London Borough of Hackney’s Quality Development Team, Andrew’s responsibilities included commissioning training videos used throughout the organisation. Through this he met Janet Potter, with whom he has successfully produced two videos, where he gained experience in production, having full project management responsibility from inception to completion of the videos. Seamus Rea is Irish by birth but a Londoner by adoption, dedication and long association. He has directed more than 25 theatre productions, specialising in community theatre and opera. As well as directing all three of cheek2cheek's films, Séamus wrote the screenplay of Two Minutes after Midnight.